Before the introduction of railways in the state, fair roads connected most of the important towns. Good roads were not numerous in Baroda State owing to the great expenses involved in construction and upkeep. The main road was Bombay-Ahmedabad or Old Trunk Road. Another important road was Surat - Khandesh road passing through Songadh and Vyara. Roads were mainly used for movement of trade activities. Usual conveyance through out the state was large wagon called gadu. Motor services were also available in some parts of the state. Some traffic was by sea from the ports of Dwarka, Okha and Bilimora. Ferry Boats were also used in the state, in connection with chief lines of traffic, which passed through rivers, mainly Mindhola, Ambika, Tapti, Narmada, Mahi, Vishwamitri, Sabarmati and Okha. The Baroda State, its rulers, dewans and residents had a fancy for railways. They were first to permit Col. JP Kennedy of Bombay, Baroda and Central India Railway (BB&CI) Company to launch their railway line from Surat to Baroda in 1855. The first train came to the capital city of Baroda on 9th January 1861 and the city was connected with Broach and Surat. In 1863 BB&CI Railway completed the Surat-Baroda-Ahmedabad line. Bombay (Grant Road) was connected with Baroda in 1864 via Navsari and Bulsar. By 1879 Baroda was connected with Delhi via Palanpur, Ajmer, Jaipur and Alwar. Shortly after the introduction of BB&CI Railway in the state, Maharaja Khanderao took the lead and built his first line to connect Dabhoi with BB&CI main line at Miyagam. It was the first such attempt by a native ruler anywhere in British dominions. In Feb. 1862, Maharaja Khanderao opened 8 miles of narrow gauge railway line of 2 feet 6 inches, from Dabhoi towards Miyagam. Oxen were used as the motive power! It was also known as Bullock Tram. In 1873 the line was re-laid with stronger rails to allow locomotives to be used although locomotives were not used regularly on this until 1880. 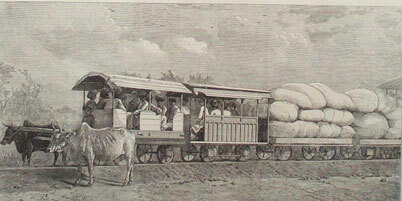 This later became part of the Gaekwar's Baroda State Railway. Shortly thereafter from that humble beginning the wings spread and Gaekwar's Baroda State Railway (GBSR) laid railway lines in other parts of the state.